The W-2 and the W-4 are two forms issued and reviewed by the Internal Revenue Service for purposes of determining and reconciling an individual worker's income tax burden. They both have to do with employee wages. Understanding their different purposes is key to understanding how they differ. W-4: The purpose of the W-4 form is for the employee to report to the employer the number of allowances to be used in calculating the employee’s payroll deductions. By providing such information as marital status and number of dependents, the employee indicates the number of withholdings the employer should use when calculating federal payroll tax deductions. W-2: The W-2 is a document on which an employer reports the wages for a specific employee for the year. 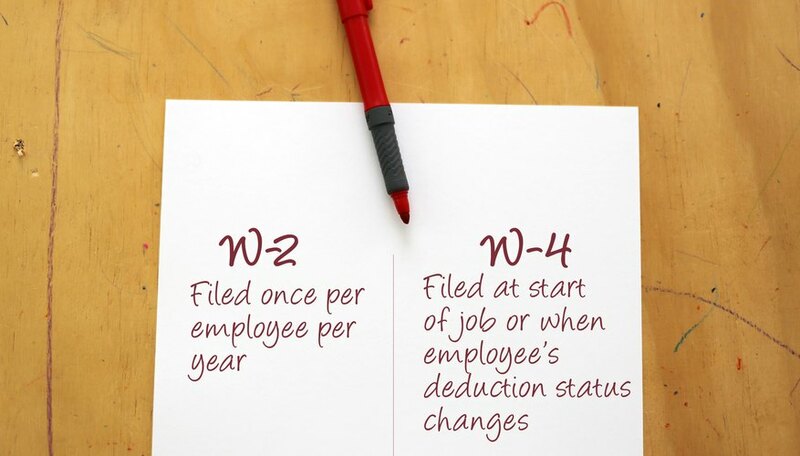 W-4: The W-4 is a dynamic document that may change multiple times throughout an employee’s tenure with an employer. This form is filed when an employee starts a new job. It is amended and refiled each time there is a change in status that would require an updated W-4, such as the birth of a child, divorce or marriage. W-2: The W-2 is filed once per employee each year. This is typically done by the end of January to reflect the prior year's wages and withholdings. It is sent to the IRS with the employee's income tax statement. W-4: The W-4 can be filed multiple times, but at a minimum it will be filed at the beginning of an individual's employment. It will be then be refiled each time there is a change in the individual’s status that warrants a change of withholding allowances. W-2: The W-2 is filed once per year. 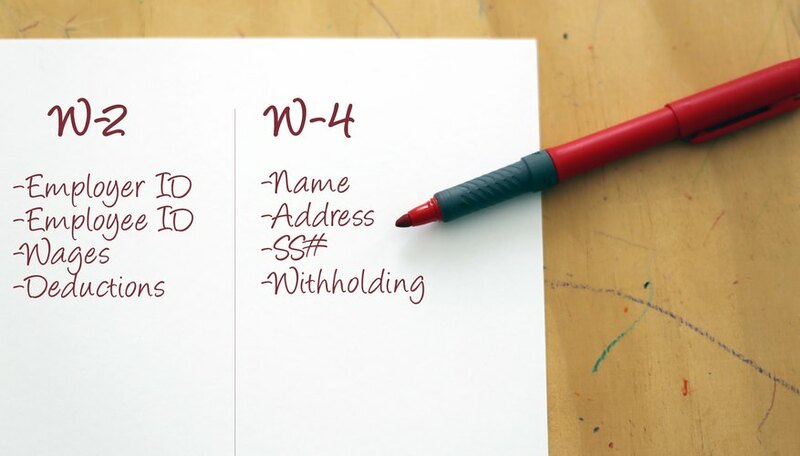 W-4: The W-4 contains the employee's identifying information—name, address, Social Security number—and withholding allowance information. 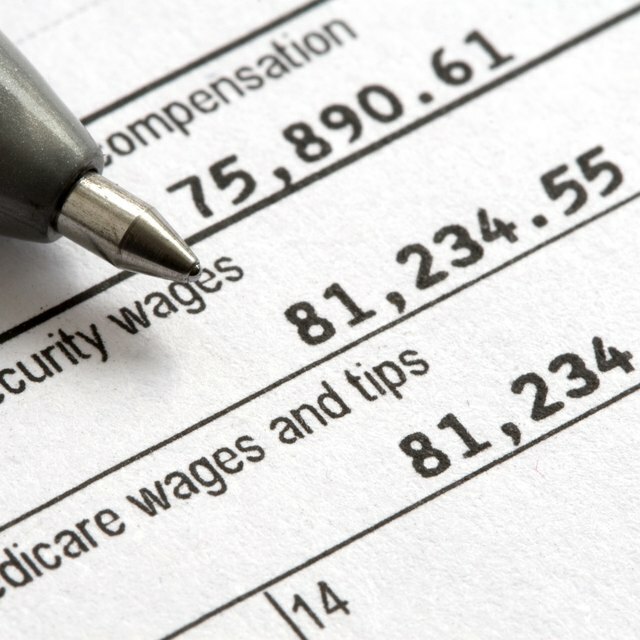 W-2: The W-2 contains identifying information about the employee, the employer and wages and deduction breakdowns for the employee for the year. W-4: While the employer is responsible for keeping the completed form on hand and using the information, the employee is responsible for completing the form. W-2: The employer is responsible for completing the form W-4, filing one copy with the IRS and giving the employee multiple copies to use with his or her individual income tax returns. 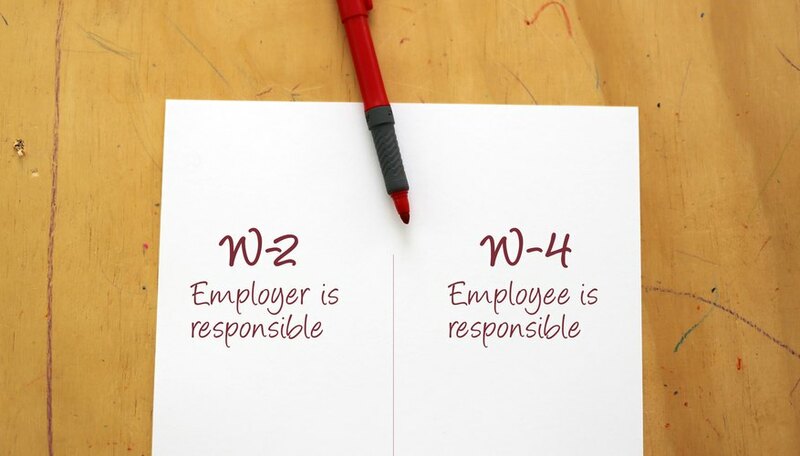 W-4: The W-4 generally stays in the hands of the employer. There are times when the IRS will request copies, but this is rare. 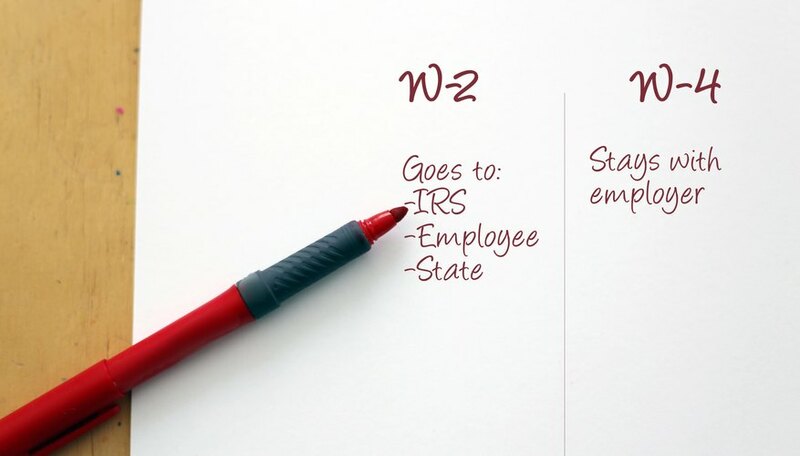 W-2: The W-2 goes in multiple directions. The employer files copies with the IRS and the state taxing authority. The employer also gives multiple copies to the employee to file with tax returns. Both the W-4 and the W-2 forms can be found on the IRS website, with complete instructions. Michele Hester holds a Bachelor of Business Administration from Georgia State University and received her Master of Arts from Dallas Theological Seminary. She is a certified Microsoft business management solutions professional and has 20 years of experience in accounting and ERP consulting. Her writing has been included on Associated Content, eHow.com and About.com.